Greenskins live to fight! Whether nomadic, territorial, or living in the filthy, despoiled remains of their latest vanquished foe, predictability their next action will almost certainly be to wage war. Their society works on a structure of sorts. Might is right and if you can’t be mighty, fight dirty. It was once said, that if they could only conquer their desire for in-fighting and self destruction, that they would one day have complete dominion over the whole world! As an O&G player myself, I was particularly keen to see how it would affect the 6000 points plus that I have already amassed over the years. This book is 112 pages of pure beauty, odd really when you consider the subject material. The new hardback format (for all future army books if rumour is true), is an absolute masterstroke. The entire publication is presented in glorious full colour, from robust cover to robust cover, this book will not fall apart. As one would expect from GW the book is laden with beautiful artwork, some familiar, some refreshingly new, all beautiful. There are 14 pages of mind-blowing miniatures showcase, showing just how varied and characterful this army can be. All of the information is presented in a new, but still very easy to understand way. This new format will, in my humble opinion, create it’s own sub-section of ‘must have ‘em all’ collectors. I can already see, in my mind’s eye, how fantastic all the Army Books will look fighting for shelf space in our house. Now to the nitty-gritty. What does the book mean to the people who play this Army? This review will not (and indeed can not) answer all of these questions. Before the addition of the 2 new heroes & 3 new troop types, the O&G already possessed the most varied array of options of any army in the game, and with that, a vast amount of army builds as individual as their creators. As with any change of army book, there are winners & losers, ups & downs or comings and goings. The addition of the Arachnarok (reviewed separately) adds a much needed (slightly more reliable than a giant) Big Guy. The addition of the Nasty Skulkers makes Goblins a tad more attractive troop choice. The ability to take Goblin Chariots in units (1-3) is a nice variation. Animosity is less punitive. The various tweaking of points values, lifting of number restrictions and re-categorization of certain troops makes the army more compatible with other 8th edition forces. 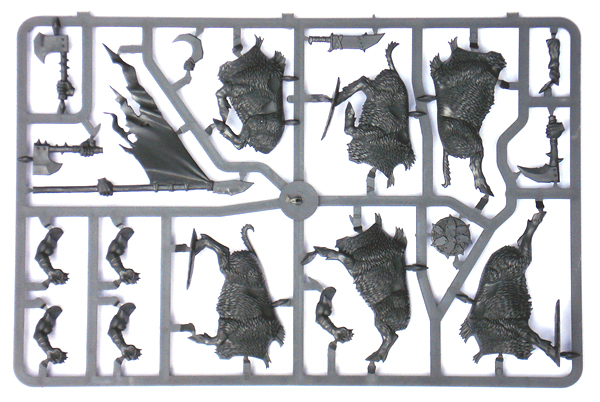 For the completely insane, that Squig army build is now a more viable option! The removal of the ‘Waaaagh!’ spell and general changes to magic: I’m sure that the analytical brains who come up with the formulaic ‘best build’ armies will find new, interesting combos that are hidden to me, but the Waaaagh was a great leveller (literally!) against high initiative opponents. There are now only 8 (yes 8!) magic items in the ‘Shiny Stuff’ segment. Three of which cost 100 points and all but one of the remaining five carry heavy restrictions. Magically, all around in my opinion, the army has been ‘nerfed’. Difficult to really know having not put the book through a ‘field test’ under 8th Edition Warhammer; initial gut feeling is that the introduction of this beautiful tome will not radically alter the Greenskins perceived place amongst the ‘fun only’ armies. In the current game, speed is of the essence and merely possessing the ability to ‘‘it really ‘ard’ is not going to matter if you’re no longer around by the time your number comes up! Having said that, the army still remains top of the tree when it’s down to sheer enjoy-ability. How the army will fare against the real tournament contenders out there is anyone’s guess. The jury really is out on this one! The actual book, as an item, is indeed a thing of beauty. The production values, quality, appearance etc. are all unequalled in the hobby. An essential purchase for any serious Warhammer Fantasy Battle player. 9/10. Having been reliably informed that Jeremy Vetock (GW’s resident O&G aficionado) was the penman on this edition, I was genuinely excited at the prospect of an army that could stand toe to toe with the likes of Demons, Dark Elves etc. Frankly, however, I’m underwhelmed & remain unconvinced that this is what has indeed been delivered. So, content in game terms gets only a disappointing 5/10. Still, that’s an average of 7/10 overall. Go Green! 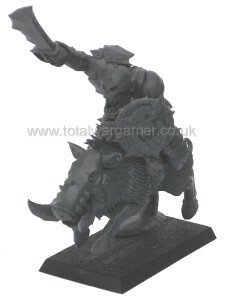 Orc Boar Boyz are the closest the replica rolex green skins have to heavy cavalry, as the name implies boars are ridden in the place of horses. You never truly train a war boar you just learn to hold on… Tight. 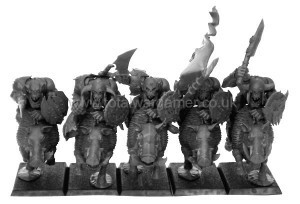 When I first saw the pictures of the new Boar Boyz it was apparent that they represented a vast improvement on the old mental/plastic boxed set, particularly the new boar mounts which I thought looked particularly characterful. 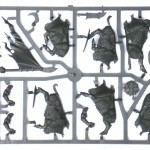 The box contains contains 3 sprues and they are crammed full of goodness, see below. 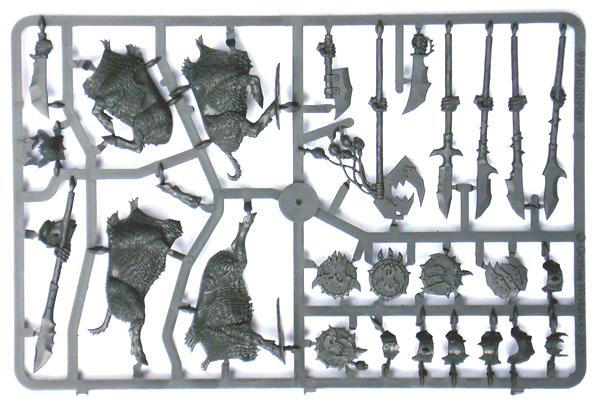 The first thing you will notice when you take a proper look at the various parts available on the sprue is that there is a lot of scope for personalising your boar boyz and their mounts. Lets start with the boars, we have 3 basic body shapes, which is a slight disappointment, but when moving on to looking at the boar’s heads you can see straight away that there are a vast number of different combinations possible, so no two boars need ever look the same. There are 6 heads to which can be added a choice of 6 jaws and 5 pairs of ears, although it has to be said that 2 of the heads can only be used with 2 of the jaws. Reaching for the calculator (actually make that the spreadsheet) I work out that there are a grand total of 300 different combinations possible here, now I could be wrong and also some of these combinations will not look terribly different but I’m impressed. Next up the boyz themselves, it appears that all 8 heads and bodies are fully interchangeable as are the various weapons, standards and the horn. Add to this 6 shields, 7 shoulder pads and 1 metal jaw… I’m not even going to try to work that one out. Suffice to say the box provides all the options in the army book and if buying more than one box it means you can field a unit with full command while the rest of the unit can be armed with the weapons of your choice. The boar boyz models were very easy to put together and once built you can sit back and admire your unit of boar boyz and take in some of the great details on these models. 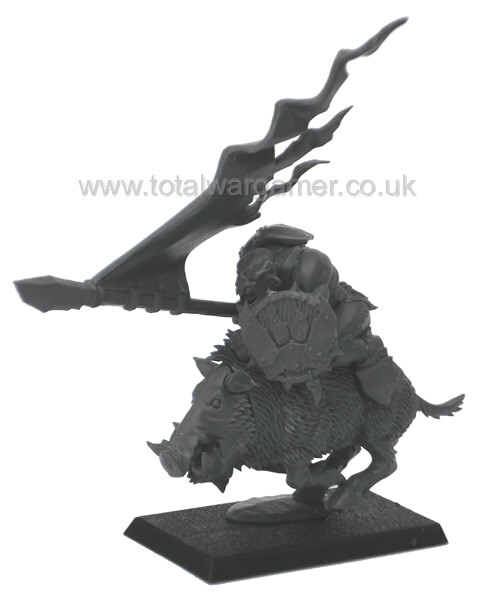 The riders too blow the socks off their old counterparts, the way they sit on the boars, perched up high, somehow seems more believable and one of the nicest touches in the entire kit is the way their free hand is grasping a tuft of their mounts shoulder hair so they don’t get thrown off. All in all… They somehow manage to encapsulate exactly what I would imagine a Warhammer Boar Boy to look like. Finally looking at the amount of plastic that you get for your £15 RRP you get a sense that this kit represents good value for money. 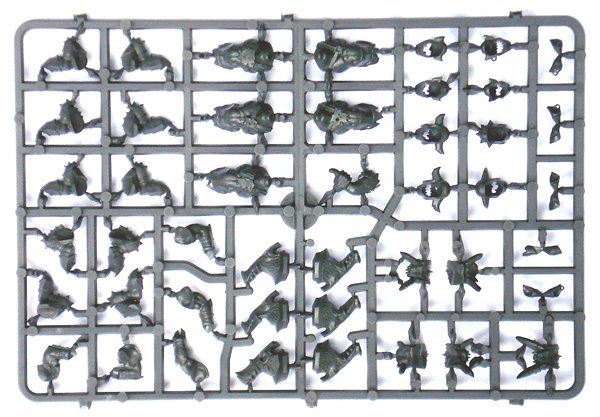 The last 2 Games Workshop kits we’ve reviewed on Big Orbit games have come with just 2 sprues and have cost £20 each (Blood Angels Death Company & Sanguinary Guard), in those kits you only got 5 infantrymen where the Boar Boyz box contains 5 cavalry. There aren’t a lot, if I did have a gripe it is that there are only 6 shields, now this wouldn’t be a problem it they were quite plain. However, as they are all so distinct duplicate shields will stand out in a unit. After all the attention to detail that was paid elsewhere this seems a shame. Maybe 2 part shields or some other solution can be found for future kits, if this is an issue to anyone but myself.